The inscription in one of these books – which I received as a gift – gives the date as ‘Christmas 1990’. That’s only 24 years ago and yet it seems to come from a completely different era. There are no photographs. The illustrations are in black and white. It isn’t written by a celebrity chef. And the structure is idiosyncratic. But these two books, Simple French Cuisine from Provence and the Languedoc and Cuisine Grandmère from Brittany, Normandy, Picardy and Flanders, are among the most used in my kitchen. The recipes are not precise, they are rather in the style of Elizabeth David in that they don’t explain every single step. Unless you are quite a decent cook you might need a little more hand holding. And you might not, following these instructions, be able to rescue a dish if it goes wrong. But this is not a criticism. Jenny Baker simply assumes some knowledge. And the dishes, in any case, aren’t complicated; most cooks should be able to pull them off. Why are there so many notes in the margins and pages with the corners turned down? Because it’s real food, the kind of food that France is famous for and the dream of which still drives us there for holidays. Larblez au four - pork slathered with mustard and cooked on a bed of potatoes and onions - pommes de terre aux poireaux en blanquette, and douillons, or pears in dressing gowns (that is, cooked in puff pastry). Easy, everyday recipes that have roots. I know it’s now fashionable to say that we always saw France through rose-tinted spectacles, that the dream of French food was much better than the reality, but in my experience, on exchanges with French students and later as an au pair, this was the kind of food you found even in modest homes. There are ‘ordinary’ but very useful dishes for which you barely need to follow a recipe, such as le ‘Berlingueto’, hard-boiled eggs stuffed with anchovies, garlic and parsley; sausages cooked with beer, apples and potatoes; a purée of white beans and garlic; Breton onion sauce, a béchamel mixed with loads of onions that have been cooked to a purée, flavoured with thyme, a little mustard and calvados (wonderful with both roast lamb and chicken). And there are short paragraphs that don’t amount to recipes but are more just ideas, or bits of information. I had never heard, for example, of a communard – a kir made with crème de framboise and red wine – but now I have them as often as I have a kir made with the more familiar crème de cassis and vin blanc. I love the structure of the books. The titles of different chapters are based on ingredients that can be grouped together: ‘cherries to sloes’; ‘mushrooms and a black truffle’; ‘juniper and la chasse’. And at the end of each book there is a miscellaneous section of what Baker calls ‘Etceteras’. These, rather excitingly, don’t only comprise basics (although béchamel and shortcrust pastry are there), but also recipes for things that aren’t regarded as necessary, that are the ‘etceteras’ of a good life in a French country kitchen. There’s instruction on how to dry orange zest, how to make deep-fried pastries called oreillettes (pigs’ ears) and crêpes dentelles. Like every food lover who crosses the Channel, she is struck by the idea that what is being cooked in this region, not far from England, could also be ours. The illustrations – of big fat pumpkins, strings of garlic and bottles of armagnac – are old-fashioned and charming and I don’t think they’re used sentimentally. 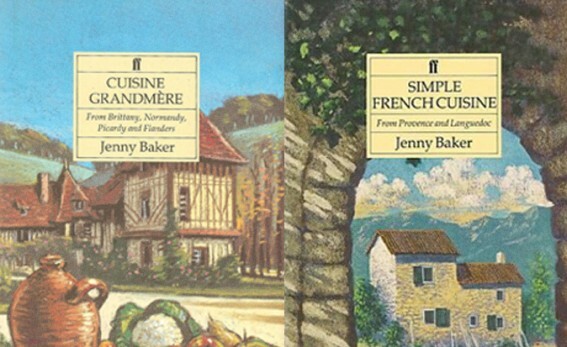 Jenny Baker has soaked up daily life there, and is clearly steeped in French country cooking. There are literally thousands of books that cover French country cooking. Many are lavish, with gorgeous photographs. A lot of them are about a fantasy of French food. You might daydream off the back of them, but you won’t use them. Jenny Baker’s two lovely books, on the other hand, are from a real kitchen and are packed with dishes that cry out to be made. Yet both of them are out of print. There are some cheap copies on the internet, or you might also stumble across them in a second-hand shop. However you can get your hands on them, I’d advise you to grab them. From their pages you can visit the warm south of France or the cool, less hip north west. Often when I’ve longed for a break in France that I don’t have the money or the time for, I’ve just gone back to Jenny Baker, planned some meals and cooked. Real France. Through real food. Baker, who divided her time between France and London (and got into cooking as a child growing up in Devon) did write several other books. Her volume on fish is excellent and I’ve just tracked down a copy of her book on English food called Kettle Broth to Gooseberry Fool. I can’t wait for it to arrive. Where are you, Jenny Baker, and why did you stop writing? I wish you’d take it up again. We need books like yours.